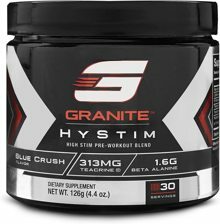 Jun 05, 2018 Granite Supplements HyStim High-Energy Pre Workout Unveiled! 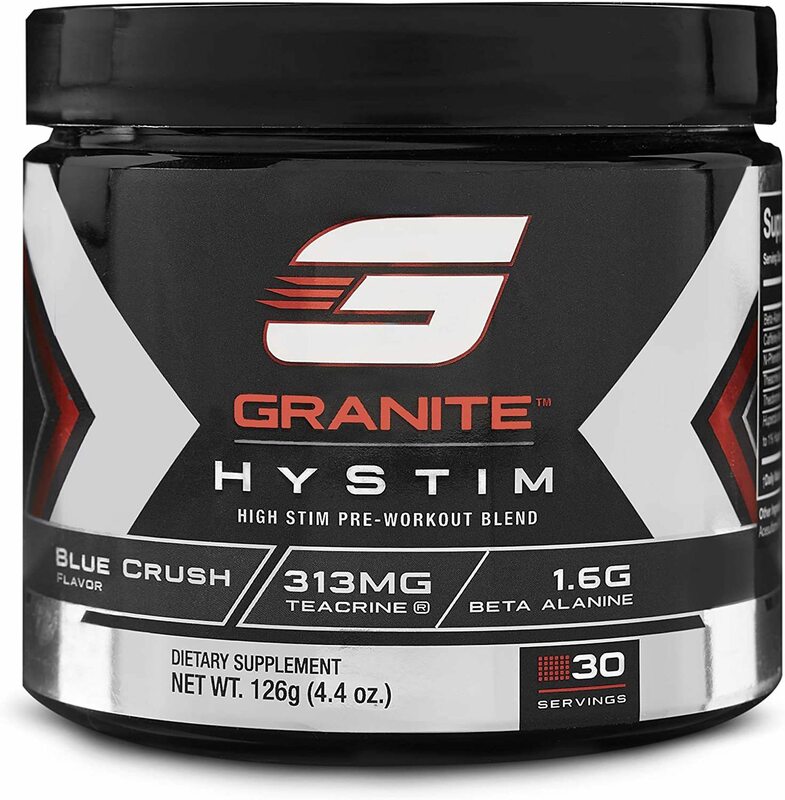 Granite Supplements HyStim - Brain Boosting Pre-Workout Formula! We couldn’t call this product HyStim if we didn’t include caffeine (350mg of caffeine anhydrous), perhaps the world’s most popular energy booster. Caffeine has a wide variety of ergogenic effects and is both thermogenic, and lipolytic, making it a viable staple for any fat loss regimen. The HyStim “alkaloid trinity” is topped off by theobromine (100mg), another mood booster for some individuals that counterbalances caffeine’s hypertensive (blood pressure elevating) effect. It’s possible that theobromine may synergize with caffeine to promote arousal but reduce perceived exertion during exercise because it’s also a bronchodilator. But wait, there’s more! We’ve quadrupled down to ensure HyStim puts you in the right mood to train, by including Huperzia Serrata [the Chinese herb known as Qian Ceng Ta ], standardized for 1% Huperzine A (yielding 100µg). Hyperzine A is rapidly absorbed and inhibits the acetylcholinesterase enzyme , thus prolonging the effect of acetylcholine (ACh) in the synapse. Huperzine-A shows promise in improving cognition, mood and spontaneous activity in Alzheimer’s patients (~100- 800µg/day) with minimal side effects , but Huperzine A isn’t just for aging brains: Twice / day dosing of 50µg improved memory and learning in middle school students as well . As a bonus, Huperzine A seems to be brain healthy, as it protects neurons against injury by a variety of toxins and stresses . There’s a new kid on the PEA block and he’s part of the HyStim gang: N- Phenethyldimethylamine (150mg, as citrate salt derived from Eria Jarensis) is a phenylethylamine (PEA) compound , meaning it’s structurally similar to tyramine (found in cheese, for instance ], hordenine[found in barley Hapke, 1995 #12129}] and many other biogenic amines, such as those found in chocolate . You’re probably familiar with the PEA derivatives found in our bodies are the catecholamine neurotransmitters (noradrenaline, adrenaline and dopamine)… The mechanistic evidence other several other PEAs suggests that N- Phenylethyldimethylamine’s stimulant actions come via modulating the metabolism of these catecholamines and/or binding to their receptors. ß-Alanine supplementation fills your muscles’ carnosine tanks, topping off your capacity to buffer acidity during high intensity efforts. This means a stronger kick at the finish line, better performance lifting weights or doing intervals, and more importantly, more muscle mass. The 1.6g dose of ß-alanine found in HyStim alone should produce a modest increase in muscle carnosine levels, but limit the skin-tingling (paresthesia) side effect that larger doses of ß-alanine are famous for. [NOTE: Ergogenic effects from ß-alanine are a probably a matter of increasing muscle carnosine over time. Supplementing with an additional ~3-4g of ß-alanine, spread throughout the day should produce much higher carnosine levels more quickly, but a cumulative dose of ~180g, spread over a longer loading period, should also do the trick.